Thank you to Dave for sending in a card from one of Geography Cat’s most favourite places, the Isle of Arran, off the south-west coast of Scotland. Arran is sometimes called “Scotland in miniature” because it has both highland and lowland areas within its 167 square miles. 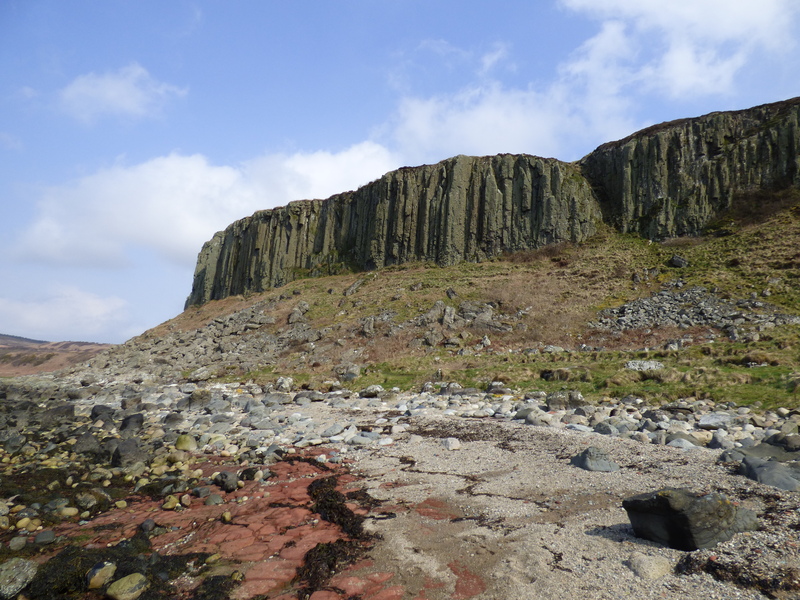 This happens here because Arran is cut through by the Highland Boundary Fault which is essentially a large crack across the surface of the crust which stretches right across Scotland, east to west. So, with all this variety in such a small space, it is easy to see why some people consider Arran to be a “geologist’s paradise”; there’s certainly a lot to study here, and it’s no coincidence that hundreds of geology and geography students visit the island every year. The green lines show the layers of sedimentary rock which were formed around 520 million years ago. At the time those rock layers were horizontal. Tectonic movements twisted the layers up into the angle they lie at now, and then something eroded them before the rock layers with the pink lines were lain on top, approximately 360 million years ago. The intervening 160 million years must have been the time it took for the original layers to be crumpled up and eroded back to a level surface for the deposition of river sediments on top that were to become the upper layers of rock. This all seems perfectly reasonable now, but when James Hutton saw this in 1787 most estimates of the age of the planet were in their thousands or a few million. Only Buffon de Maillet came anywhere close with his theory that the Earth was around 2 billion years old in the 1720s, but his work was written under a pseudonym and he struggled to get it published as it seemed so incredible. In the late 1800s the age of the Earth was still one of the most hotly debated topics amongst scientists and others. The “knowledge” we have today (that the Earth is 4.5 billion years old) has been pieced together like a jigsaw, from the work, experiments and observations of many. James Hutton’s realisation that the rocks on the Newton Shore of Arran must have taken much longer to form than a million years or two didn’t come to him in a lightbulb moment, it was by looking and thinking and examining, and more thinking, and discussing, and looking again that drew him to his conclusions. And that’s why Geography Cat loves to see Hutton’s Unconformity. It is evidence, not only of the immensity of geological time but also of the way in which scientific knowledge evolves, with the patient work of many parties who are open to possibilities but careful in judgment. The “knowledge” we have is a collection of fact, theory and perception that is constantly being challenged and refined, just as the rocks on the shore are continuously battered by the sea and ground down into sediment again. Some stunning rock formations and geological descriptions shown in this blog.